This is the largest and the best-preserved Portuguese bastion in Goa and was built in 1609-12, to control the entry into the river Mandovi and to protect Old Goa from potential enemy attacks. A freshwater spring – from where the fort derives it’s name – within the fort provided water supply to the ships that called there. Ringed by thick battlements, the heart of the fort was protected by two hundred cannons and a deep dry moat, which one still has to cross to get inside. 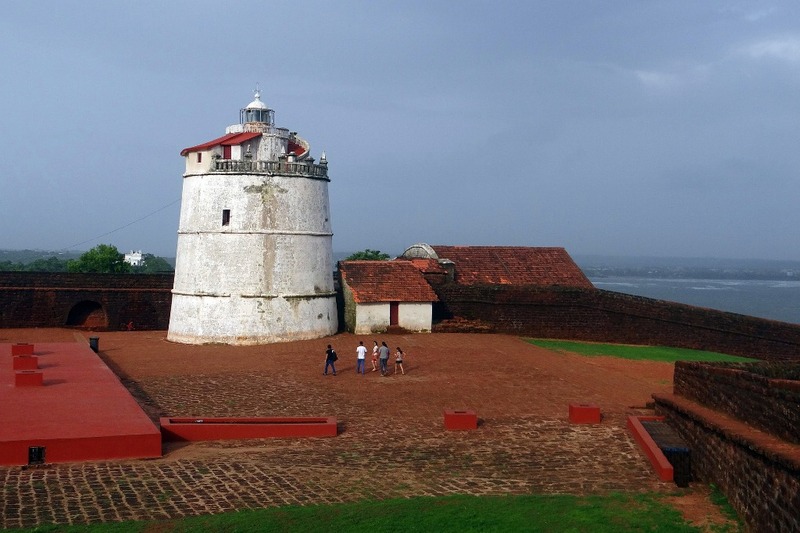 Strategically located at the estuary of the river Mandovi, this fort was constructed in 1612 as a guard against invasions from the Dutch and the Marathas. The walls of this fort are 5 meters high and 1.3 meters wide. Little surprise then that this remains to be the only fort that was not conquered by any invaders during the 450 yearlong rule of the Portuguese empire. The area around the fort housed a large well and a number of springs that provided fresh drinking water to the voyagers that arrived by ship. “Agua” in Portuguese means water, thus the fort derived its name “Aguada” to denote a place where water is accumulated. Steps lead down from the middle of the courtyard within to an enormous vaulted cistern capable of storing ten million litres of fresh water. The other unusual feature of the fort is a four-storey Portuguese lighthouse, erected in 1864 and the oldest of its kind in Asia. An interesting feature in the precinct of the fort is a 13 meter high lighthouse. This lighthouse, built in 1864, initially used an oil lamp. It was later renovated and modernized in 1976. This lighthouse was home to a gigantic bell that was retrieved from among the ruins of the St. Augustus monastery at Old Goa. However, the bell has now been moved to the Our Lady of Immaculate Conception church at Panaji. Though the entire fort is no longer intact, some buildings that are still in good shape have been converted into a prison. Interestingly, it happens to be the largest prison in Goa. En-route to the fort, one comes across the church of St. Lawrence, the saint of the sailors. The Portuguese used to build churches on the outskirts of the forts to prevent the enemy from firing at a close range.